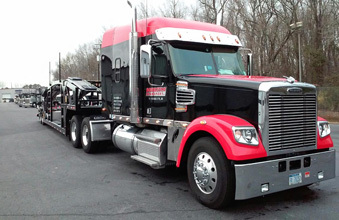 Double Time Transport started as part of AnyTime Towing of Traverse City, Michigan, which opened up in 2004. As time went on, the towing company expanded into auto transport to serve our local dealers and customers who were looking to have vehicles moved longer distances. We started with a three car hauler and over the years have added more trucks to the fleet, including several 6 car haulers and 9 car stinger units. In November of 2011 AnyTime Towing of TC was sold to allow expansion of the transport side of things. We continued on with our regional hauling with the new Name Double Time Transport at that point.